Becoming a surprise success in 2017, The Exorcist’s Meter <降魔的> spawned a sequel. The original cast returns along with new additional characters to continue the existing story. 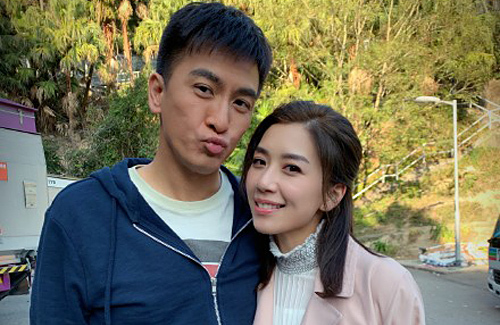 Holding the same excitement as fans, Kenneth Ma (馬國明) and Mandy Wong (黃智雯) have started filming the new sequel. Mandy uploaded a photo she took with Kenneth on the filming set. Continuing their existing characters as a doctor and demon-conquering taxi driver respectively, Mandy commented, “Siu Ma, haven’t seen you in two years. How are you? You’re tanner, and your hair is longer now. Your clothing is also much cooler.” Seeing this, fans fervently liked the post and expressed their excitement, as they couldn’t wait in seeing them act as a couple again. Kenneth’s girlfriend, Jacqueline Wong (黃心穎) also showed her support and liked the post. According to an interview at an earlier press conference, Kenneth and Mandy will be involved in a love quadrangle with new cast additions, Zoie Tam (譚凱琪) and C-Kwan (鄭詩君). It is likely the romance between Kenneth and Mandy will be intensified and be much more dramatic this time, as their relationship did not end well in the first series. Fans could not wait to chase the drama again, and some are already rooting the two leads to be the TV King and Queen this year. Why Ckwan!!!!! and why not Nicki …tiffany lau ( 劉穎鏇 ) or ROxanne Tong why Zoe tam not that i have something against her but anyways cant wait for this series to finish filming and start airing on the tube!